High-quality global resource to help clients create demand, qualify leads and boost sales. For over 16 years our live chat and teleservices have been helping clients to improve conversion rates, qualify leads and increase sales. MarketOne’s proven, data-driven methodology ensures we present the right messages in the right way, with experienced, multi-lingual teams based around the world able to engage, persuade and convert prospects of all levels. Our reporting structure enables consistent benchmarking and comparison of performance between regions, so you don’t just get the results, you can prove them. They might be talking, they might be typing. Whatever your customers are doing, they want the right experience – and that’s not easy if your outreach team is disconnected from the rest. 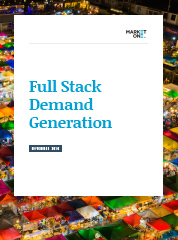 Our full-stack approach is better because it’s joined up. We know what other messages the client has seen. And when we gather information, we learn from it and pass it on. We work within your CRM system, we work with your sales teams. We are an integrated, intelligent service that combines smart technology with experienced, multi-lingual people, delivering consistently measurable performance. "MarketOne forms an invaluable bridge between marketing and sales, providing deep account intelligence and regularly exceeding targets." "We’ve partnered MarketOne in response handling and partner management across Southeast Asia. They’re one of the most responsive and value-added telemarketing agency in the market." Our Japanese team secured 52 C-Level appointments from 209 prospect accounts, a lead rate of 25%. "MarketOne has helped us generate more pipeline through online chat. They're a flexible partner, taking our objectives and goals on as their own to help drive us drive growth." "The MarketOne team recently delivered a 22% lead rate on an outbound campaign into a challenging sector - our sales team was extremely happy with the quality of the leads." "MarketOne has been instrumental in managing overflow lead generation across APJ, managing thousands of raw leads each quarter with a high ratio of lead to opportunity conversion and sales acceptance." To find out how we can help you, contact our Teleservices and Live Chat experts for an informal chat. Today’s technology buyers educate themselves via the web and often find themselves on your site looking for useful content. If you don’t reach out to them, many will disappear, never to be seen again.